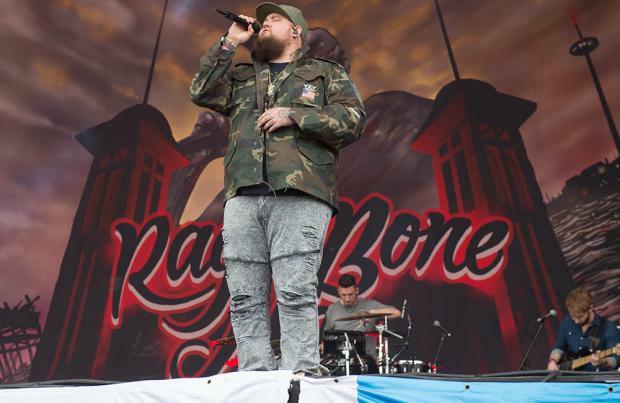 Rag 'n' Bone Man is open to more collaborations after teaming up with Gorillaz for 'The Apprentice' on their LP 'Humanz'. The 32-year-old soul singer - whose real name is Rory Graham - was joined by the likes of Noel Gallagher, De La Soul, Grace Jones and Pusha T in contributing to the Damon Albarn's animated band's comeback record and being involved has made him eager to work with other people. Speaking about releasing new music, following his critically-acclaimed debut LP 'Human', he said: "I don't know exactly when, I know I just have out out my album. I'm kind of hoping for the odd collaboration here and there." The 'Skin' hitmaker says he was blown away by the Blur frontman's unusual songwriting ability. He told ABC Radio: "The way he writes lyrics and melodies and stuff is not in the way that I've ever seen anyone do it before. It definitely made me think. It was a thought-provoking experience." Rory is currently touring in the US trying to crack the country, but he says all he can do is stay true to his honest music and perform with his heart and soul. He said: "I try to put into it everything I can. I sing the songs emotionally the way I felt they should be sung when I wrote them, and I want people to connect with them. "There's no smoke and mirrors, no bells and whistles. It's not about that. It's simply me singing the songs the way I think they should be sung. I'm putting my heart and soul into every live show."